Formula 1 had a slightly different look around the streets of Marina Bay. The Mercedes drivers were peculiarly off the pace and Sebastian Vettel took pole position for Ferrari before going on to take a comfortable victory, the 42nd of his GP career. 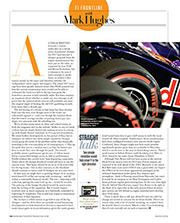 A review of the Grand Prix reports in this issue outlines a key issue facing F1 – that of tyre supply. There’s something deeply flawed when the top racing category in the world, which otherwise represents the cutting edge of excellence, limits itself a) to a control tyre at all and b) one that is deliberately engineered to degrade in a way that, by unhappy extension, forces the world’s fastest drivers not to drive at their fastest in races. It has been this way since Pirelli was asked, from 2011, to come up with a control tyre that deliberately degraded so as to ‘liven up the show’. The way Pirelli chose to do that was to introduce thermally degrading composites within its compounds – i e material that no tyre company in the world would dream of putting in its tyres if it was in competition with other companies. If the tyre reaches a certain critical temperature it loses performance massively – and there is no bringing it back, no matter how slowly it’s then driven. The chemical bonds that give it its grip are broken, snapped. Unhappily, going flat out for three or four consecutive laps is usually enough to induce this critical temperature. Backing off just a little – say by 0.5sec at some tracks, maybe up to 2sec at others – keeps the tyre below that crucial threshold and allows you to do the sort of stint lengths necessary for minimising your race time. So we see F1 drivers flat out only during qualifying for the most part. Once the top drivers in the world have qualified, there are literally hundreds who could take over and drive 0.5sec off the pace. Not quite ‘anyone could do that’ but moving in that wrong direction. In explaining this, it’s time to debunk a key defence made by supporters of this style of racing: that the alternative would be boring, stop-free races, leaving no room for tactical variety. That’s nonsense. It’s perfectly feasible to make racing tyres that are not durable enough to complete a full distance, but which degrade by a steady reduction in tread thickness rather than through heat degradation. The tyre’s performance will still progressively decrease, but the driver will be fully on it throughout. A driver who can best combine pace with taking less from the tyre – in the style, say, of Alain Prost – will still be rewarded. But they would need to lap comparably quickly, not deliberately drive off the pace. This is fairly conventional F1 rubber, as we saw during the Bridgestone vs Michelin years. Tyre wars are often seen as a negative. There’s a feeling from fans and participants alike that they muddy the competitive waters. 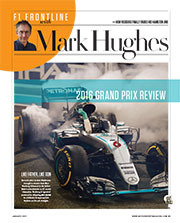 But applying such an objection to F1 – where muddied competitive waters are inherent to the sport’s whole concept, where the performance of driver and machine are often impossible to decouple – seems ludicrous. If we accept the era of the F1 tyre war is over for now, here’s a way in which F1 could make the Pirelli concept a positive one: as the sport faces the challenge of getting team costs under control, what about insisting any team beyond a certain budget/size remains on heat-degrading tyres. Any that can get below that cost/resource level will be given tyres (also Pirellis) that do not contain thermally degrading composites – and can therefore be driven flat out for the whole race. The less you spend, the faster you go (up to a certain point, at least). I suspect we’d be amazed at how quickly the teams could contract, and F1 then gets half a chance of being sustainable. In that way, the abhorrent concept of a racing tyre that cannot be driven flat out can be used in a way that improves the sport. Nico Rosberg’s right-rear Pirelli exploded on Friday afternoon at Spa just about 50 metres short of where he would normally have turned in for the 190mph Blanchimont. 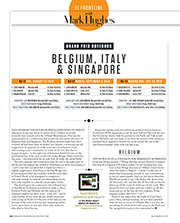 This was the opening salvo in a controversy that would run and colour the races of Belgium, Italy and Singapore. The Rosberg incident might have been brushed off had there been no further tyre failures, a worrying one-off triggered by an unusual cut in the tread but not indicative of any shortcoming in the construction or safety of the tyre. But then it happened again – to the right rear of Sebastian Vettel’s Ferrari on the penultimate lap of the race, on the exit of Eau Rouge. Vettel received a big scare – and afterwards let rip with how he really felt about Pirelli. The tyre company had found more than 60 cuts to the right rears of all the cars throughout the weekend. Something out there was causing it – and it was later accepted that it might have been a slightly jagged piece of kerbing on the Eau Rouge exit. It was suspected that this, together with the worn state of Vettel’s Pirelli as he attempted to complete a one-stop strategy around the tyre-demanding circuit, had come together to cause the catastrophic failure. 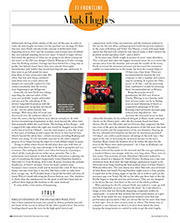 The backdrop to the controversy that followed was a) that Bernie Ecclestone was about to make a choice between Pirelli and Michelin for the contract of standard supplier for three years – from 2017, and b) some leading drivers were already deeply frustrated with racing on Pirellis not because of the failures, but because of the style of driving heat-degrading rubber forces upon them on race day, when only rarely are they able to drive flat out. 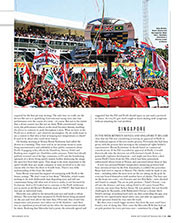 Bring that together with the underlying political tension between Ecclestone’s FOM organisation and the Jean Todt-led FIA, and the fact that Ecclestone doesn’t hide his preference for Pirelli and Todt would prefer Michelin, and you begin to see how the stresses of the situation resemble those applied to Vettel’s tyre as he crested the rise of the Spa-Francorchamps valley with one lap to go. Vettel was in full stream in the immediate aftermath of his Eau Rouge incident. “Things like that are not allowed to happen. Full stop. If it happens 200 metres earlier, I’m not standing here now. 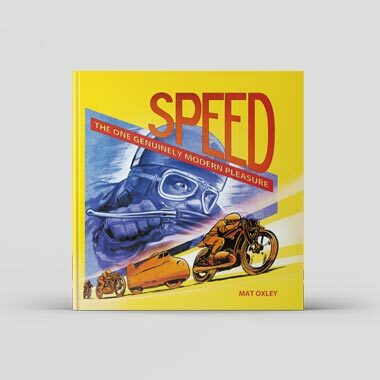 Partly it was anger from the fright he’d just been given when, without warning, his tyre had exploded while he was in excess of 190mph. But it was also the uncorking of a frustration with racing in the Pirelli era. 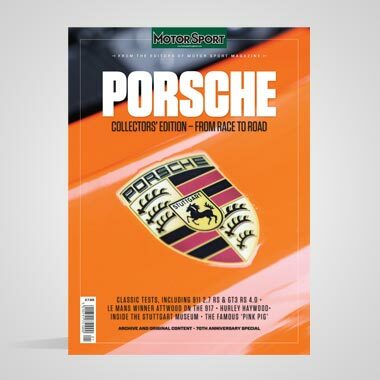 No racing driver wants to be constrained to deliberately driving whole chunks of the race off the pace in order to make the stint lengths necessary for the quickest race strategy. It’s been this way since Pirelli introduced the concept of deliberately heat-degrading tyres in 2011 and the resultant controversies have throbbed like tyre sidewall standing waves ever since. A bunch of angry drivers had posed the question of ‘what are we going to do about sorting out the tyres?’ to the FIA race delegate Charlie Whiting on Friday evening, after the Rosberg incident. Feelings had been bottled for a long time in public, but behind closed doors they were already thoroughly disenchanted with rubber that would heat-degrade into uselessness if they were to go full-attack for more than three or four consecutive laps. But when that was now being combined with blow-outs at a track where the dangers are unusually explicit by 21st century standards, then the drivers were beginning to get belligerent. Ironically the heat Pirelli was taking regarding the inherent safety of the tyres was probably largely unfounded and was just the unleashing of the drivers’ long-held frustration with the sort of measured racing they are forced to do – not for safety reasons, but strategic. With more than 60 tread cuts discovered over the weekend (about 20 times the norm), the Spa failures were almost certainly to do with drivers encountering irregularities as they went beyond the white lines that nominally define the track limits. The kerbing at Eau Rouge – with a jagged little edge where the right rear would be dragged across when under lateral load at 190mph – was the chief suspect in this. But to get to that piece of kerbing would require the driver to have had all four wheels beyond the white lines – which everyone, including Rosberg and Vettel, was doing. It’s the inevitable outcome to the safety-inspired practice of no longer having the edges of a track defined simply by grass. Trying to define where drivers should place their cars with lines of paint when there’s a lap time advantage to be had in going beyond is a nonsense. This ambiguity didn’t exist when the hazards of putting a wheel off the track played out rather more instantly. This is the unfortunate environment in which the Pirelli controversy is playing out and it’s muddying the waters dangerously. Lewis Hamilton headed a Mercedes 1-2 from Rosberg, with Lotus’ Romain Grosjean the podium beneficiary of Vettel’s incident. Given his team’s parlous state, Grosjean’s was a miracle result and he beamed like a kid. If there was a happy outcome from Spa, it was this. But there could so easily have been a tragic one. As F1 headed home it heard the horribly sad news of Justin Wilson’s death following the Pocono Indycar race. One shudders to think what the ramifications for the sport would have been had we suffered three high-profile fatalities in the same weekend. It came within a few metres of happening. Pirelli’s findings of the Spa failures were that they’d been initiated by tread cuts caused by debris, probably beyond the limits of the circuit as defined by the white painted lines. The severe loadings placed upon the tyres by the high-speed lateral and compression loads of Spa are notorious and the weakness induced in the tyre by the cuts when undergoing such loads had proved explosive in the cases of Rosberg and Vettel. 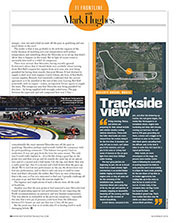 For Monza, a track with super-high speeds but flat and with relatively easy lateral loads, it didn’t believe the problem would reproduce itself – and it didn’t. To be extra sure, Pirelli sought to protect its tyres’ outer shoulders. This is the part that takes the biggest structural stress. So as to move the stresses away from the shoulder and towards the middle of the tread, Pirelli increased the minimum pressure and decreased the maximum camber recommendations to the teams. Up from the normal 18psi to 19.5psi rear, 21psi front. These are recommendations because the tyre company is only a supplier and cannot impose anything. It requires the FIA’s power to do this – and the governing body confirmed it would be enforcing these ‘recommendations’ at Monza. Being the poacher turned gamekeeper, the FIA race director Charlie Whiting is very familiar with how devious teams can be in finding ways around limitations if there’s a competitive advantage to be had. Running lower pressures increases grip, reduces heat degradation – but increases the structural stress on that vulnerable shoulder. So his technical delegate Jo Bauer made some spot checks on the Monza grid – after the five-minute board had been shown. On the two Mercedes and two Ferraris that comprised the first two rows of the grid, he checked the pressures of the left rears (the most heavily loaded) and the temperatures of the tyre blankets. Heating up the tyre sidewalls with blankets set beyond the maximum permitted 110-deg C can confer a performance advantage in the early laps – but again at the risk of increasing the structural stresses on the tyre’s shoulder. Bauer found the blankets all to be within the limit but the tyres of the Mercs were under-pressured – by 1.1psi on Rosberg’s car and 0.3psi on Hamilton’s. Bauer referred the matter to the stewards and the race got underway, a standard Monza one-stopper with two very long stints. There were no tyre issues. Not on-track, at least. Hamilton’s Mercedes waltzed to victory, chased at a distance by Vettel’s Ferrari. Rosberg was a late race retirement from third after the high-mileage replacement engine in his Mercedes went bang, handing the final podium place to Felipe Massa’s Williams-Mercedes. The only drama was when Mercedes was informed of what Bauer had found. Fearing Hamilton might receive a 25sec penalty, it urged him in the closing stages to lap flat out in order to pull out the necessary gap over Vettel. He did so, but after just three laps of this the Pirellis began to degrade and lose performance. They are not designed to be driven flat out. And that’s at the root of the whole problem. 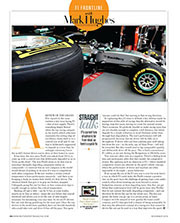 When pitching for the F1 contract Pirelli was tasked to come up with tyres that degraded, so as to ‘improve the show’. 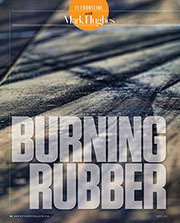 So it introduced a range of tyres that has thermally degrading composites within its compounds – ie material that worsens the tyre’s performance as it gets too hot. 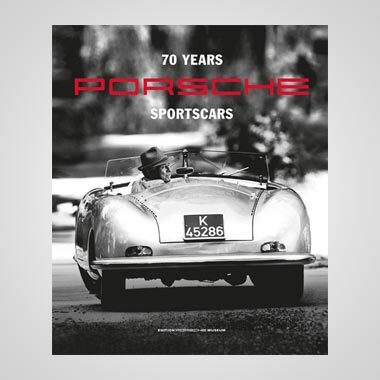 It has made for very temperature-sensitive tyres that lose performance spectacularly if they are driven flat out for more than three or four laps – less at some circuits, more at others. The fastest way to complete a race distance on them is to drive them below the limit, keeping the temperatures in control in order to get the stint lengths required for the best pit stop strategy. The only time we really see the drivers flat out is in qualifying. Conventional racing tyres also lose performance over the course of a stint – of course. But not to the extent that a driver cannot race flat out on them. With conventional racing tyres, the performance reduces as the tread becomes thinner, enabling the driver to continue to push throughout a stint. What we have in the Pirelli era is artificial – and relatively meaningless. Do we really want to see a contest to find who is best at keeping tyre temperatures in check? It used to be about who could drive fastest. On Sunday morning at Monza Bernie Ecclestone had called the drivers to a meeting. They were told in no uncertain terms to cease being unconstructive and unhelpful in their public comments about Pirelli. A gagging order, effectively. Hamilton, Alonso, Vettel and Rosberg were singled out. Doubtless under pressure, Vettel had already publicly reversed out of his Spa comments, so F1 saw the humiliating spectacle of a driver being openly tamed, further destroying the image the sport has been built upon. That image is far more important to the sport’s health than any single company or team involved in it, the very reason why it’s there for them to benefit from. There’s very little understanding of this from the inside. Later Bernie reiterated his support of continuing with Pirelli in the future, noting: “We don’t want to lose them.” Michelin, which wants nothing to do with deliberately heat-degrading tyres and will not countenance being told what sort of tyres to make, is not favoured by Ecclestone. And so F1 looked set to continue in the Pirelli wilderness just as surely as did Bernie’s Brabham team in 1984-87. But back then it was just an individual team. Mercedes was called to the stewards post-race and made a robust defence. The tyres had been measured by Pirelli before being mounted on the cars and were above the limit then. Obviously they would lose temperature and pressure once taken out of the blankets – and there was no regulation protocol laid out for when the measurement should be taken. Realising that Mercedes had a point, the stewards agreed and suggested that the FIA and Pirelli should agree on just such a protocol in future. As ever, F1 gets itself caught in knots dealing with symptoms without attacking the root problem. In the week between Monza and Singapore it became clear that the FIA was considering reviewing its approval of Pirelli in the technical aspects of the tyre tender process. Previously this had been given, with the process then moving to the commercial rights holder’s representative (Bernie Ecclestone) to decide based on commercial considerations. If the FIA rescinded its approval of Pirelli, it would theoretically take the decision out of Ecclestone’s hands. 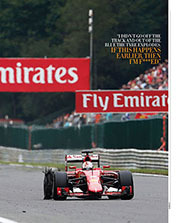 It was a potentially explosive development – and might just have been a shot across Pirelli’s bows from the FIA, which had been particularly embarrassed about events at Monza and concerned about those at Spa. A new tyre pressure/blanket temperature measuring protocol had been introduced here by the FIA. Essentially, it codified the procedure Bauer had tried to impose at Monza. 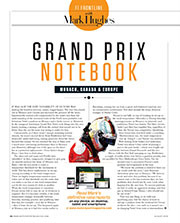 The checks could be made at any time – including when the tyres were on the car sitting on the grid. So everyone busied themselves with another layer of checks. The four cars on the front two rows – two Ferraris and two Red Bulls – were checked and found to comply. 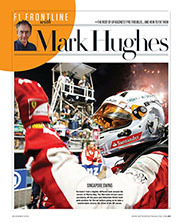 The car on pole position – Vettel’s Ferrari – ran off into the distance and won, taking Vettel to 42 career Grand Prix victories, one more than Ayrton Senna. He was pushed, but not directly challenged, by Ricciardo, with Räikkönen’s Ferrari a distant third. Vettel’s strategy of pushing hard early on, then controlling the gap, was aided by two opportunely timed safety cars, one after an apparently drunk spectator found his way onto the track. But there was a much bigger mystery than how the man could have found a way of doing this. How come the Mercedes W06 that had sat on pole position for every previous race – sometimes by a huge margin – was one-and-a-half seconds off the pace in qualifying and not much better in the race? The reality is that it was probably to do with the vagaries of the tricky business of matching tyre core temperatures with surface temperatures and something about the Mercedes or its set-up that didn’t allow that to happen on this track. But in light of recent events it inevitably lent itself to a whiff of conspiracy. The logistics and implications of such a theory were off the scale of feasibility. Another was that the new protocol had removed a way Mercedes had found of generating superior tyre performance by not respecting the Pirelli recommendations on pressures and tyre blanket temperatures. This was almost as outlandish as the previous conspiracy – especially the idea that a few psi of pressure could have been the difference between F1’s fastest car and one that was 1.5sec off the pace. Friday morning, Monza, and drivers are preparing for their annual wrestle with skittish missiles running minimal downforce. Those with the fuller data banks are more relaxed than the rookies doing it for the first time. A simulator can only tell you so much, can’t place you in the moment, can’t put you in the zone or convey that sense of menace as the car goes light from more than 340kph under braking. The sky’s grey patches are beginning to part, the air at Ascari fresh from a dawn shower. Gigi’s commentary is an excited Italian babble ringing out between the engine noise as they all come out for the ceremony of the installation laps, headed by Sebastian Vettel and a wing flap of flo-viz, the spit and splutter of complex mapping on downshifts bouncing off the scenery, and Gigi has built up this moment of theatre beautifully. A brief silence, everyone in the pits, and after this limbering-up routine, the real game begins. The rookie Max Verstappen is on immediate attack, engine tone hardening and deep mid-chicane, running out hard over the exit kerb in fifth gear, grounding out there, a dance and a wiggle as he continues to pour on the power, skid block sparks cascading from the diffuser and, in the time it takes to write that, he’s back for a repeat performance. But the point was that in its artificiality F1 is lending itself to such damaging beliefs.